In my spare time I run a big band swing group that consists of 22 people (18 musicians, and 4 singers). Each musician/singer needs to download their part for a particular song's arrangement (E.g. bass - "Accentuate the Positive.") 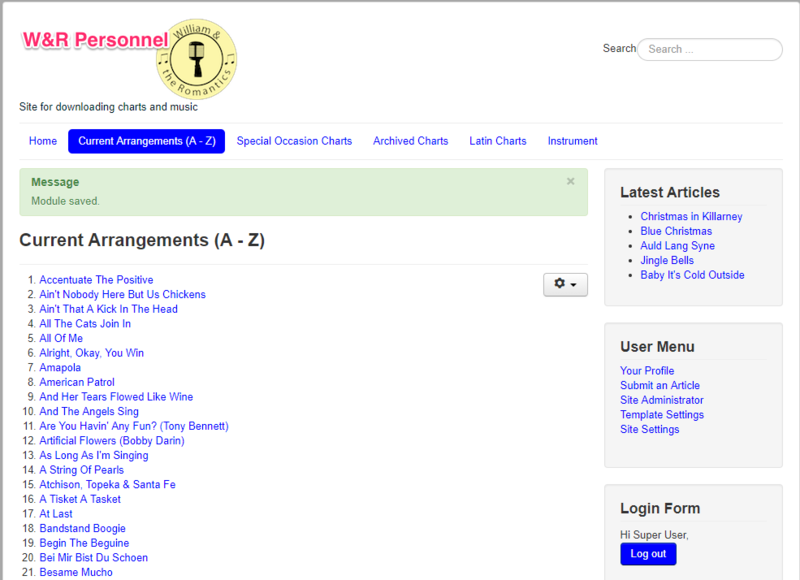 I am currently using Joomla 3.9.1 for my band's personnel site. This is a centralized location where they can log on, download the song for the arrangement (yes, I purchase them), and also download their particular instrument's part. One of my main menu pages is called "Current Arrangements (A-Z)." This contains a list of the current arrangements we might choose to play at a gig. An arrangement consists of all the parts for that particular song, that I have (perhaps naively) written using HTML ul/li tags. Understandably, some arrangements have less parts than others. Let's say a user selects "Accentuate the Positive" for his/her part. Suppose I am the group's bassist (a very cool guy, BTW). I click the Bass Guitar link and the PDF pops up for him to either download or print. Here's my problem: I'd like for a musician to be able to see only his/her instrument's part in the arrangement. They don't need to see all of the other arrangement's parts. The band's music director needs to see all of the parts in an arrangement, as do I. Right now the main menu item "Current Arrangements (A-Z)" Menu Item Type is set to "Single Article." In the "Select Article" box I have Current Arrangements (A-Z). This works, but upon clicking a song I want, I get the entire arrangement's page. It's sloppy because it brings up all of the arrangement's parts. I've spent hours doing basic HTML stuff to get them arranged on each page. 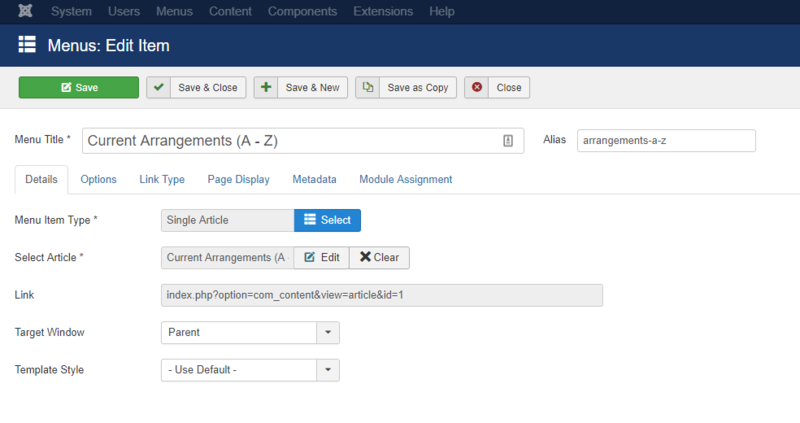 I think I may not have been very smart in how I am utilizing Joomla's strengths. I am totally willing to rearrange the content if need be, but I'd like to avoid it if I can. I've goofed around with some YT videos and web articles talking about arranging by blog type. Doesn't seem to work. I'm also wondering if there isn't an extension that would help me get to my goal: A regular user should be able to grab just his/her instrument's arrangements for download or printing purposes. This would especially be a super-helpful thing for sub musicians who only need to see their parts: they don't care about other musicians in the band. I also thought about writing a view, but this seems like some heavy lifting. However, I'm willing to tackle it if need be. Any advice, counsel? You are having to do way too much work by using Joomla! Articles and HTML. It can be done this way with a bit more advanced coding. However, there is a much simpler way--use a download manager extension. I prefer to use DOCman, but any will do. Assign each of your members/users to the appropriate user group inside the User Manager. Master director for all songs (i.e. "Current Arrangements (A-Z)"). You can omit this step if you won't use the download manager for anything else besides song parts, but I'd go ahead and do it either way. Sub-director for each song (i.e. "Accentuate the Positive"). Upload each part for each song inside the song's directory with permissions only to the user group for which the part belongs, as well as the "Director" and "Administrator". Create a front-end view (menu item) for the download manager showing the master song directory with permissions for "Registered" users (assuming the band and staff are the only ones with user accounts). Now, when each person clicks on the link to the song directory, they will be required to sign in. They will all see the directories for each song. However, once they open each song's directory, they will only see the download for which they have access to (i.e. their own part(s). If you ever have sheets where the entire brass section is on one sheet but in different staves, assign that part to the "Brass" user group and then all the brass players can access the part. You can do the same for Singers, Musicians, Woodwinds, Rhythm, etc. If you want to take it a step further, you can add notes in the description for each directory and/or file upload that gives instructions to the players/singers.